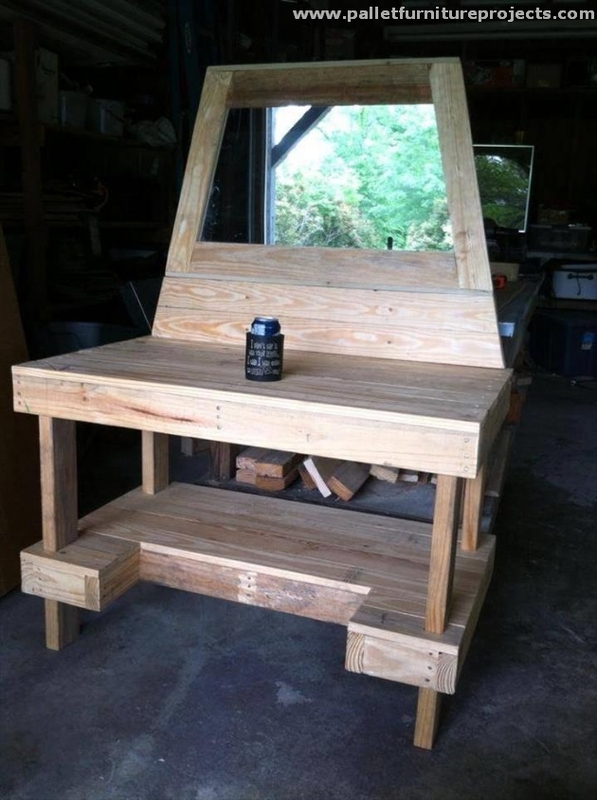 Our distinguished forum of pallet wood recycling never believes in or encourages the gender discrimination. For us, all of our subscribers are equally important to us. That’s why we keep doing many projects especially for the respectable ladies. This gives us a strange satisfaction and also very warm participation by many gorgeous ladies as well. 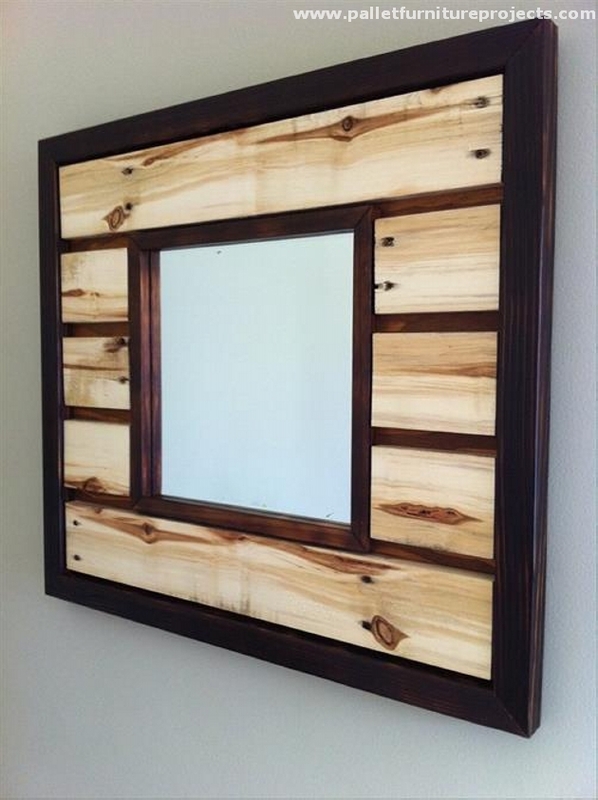 Just maintaining the legacy of this forum, we are presenting the pallet wood vanity mirror ideas. 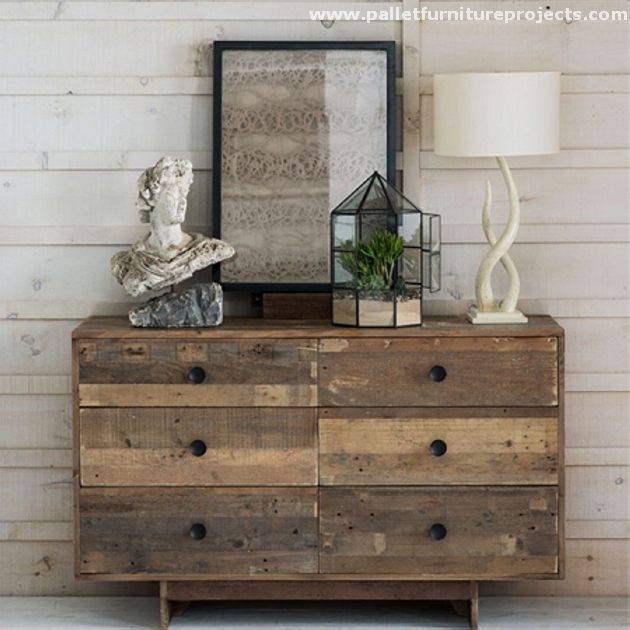 They are the most traditional furniture item that is counted and noticed. We pay pretty large amounts on them while buying from the market. 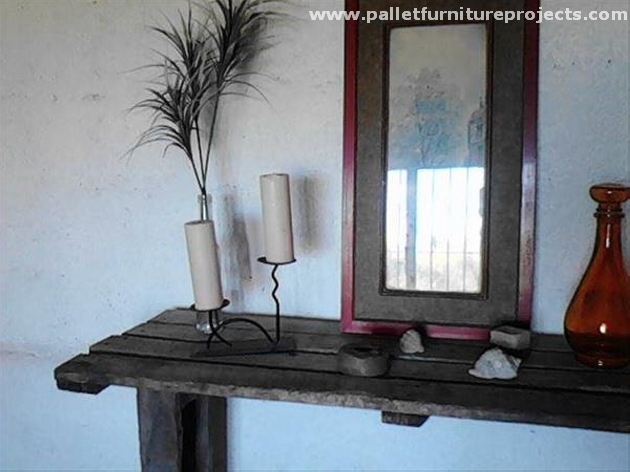 This time try them with pallet wood recycling. 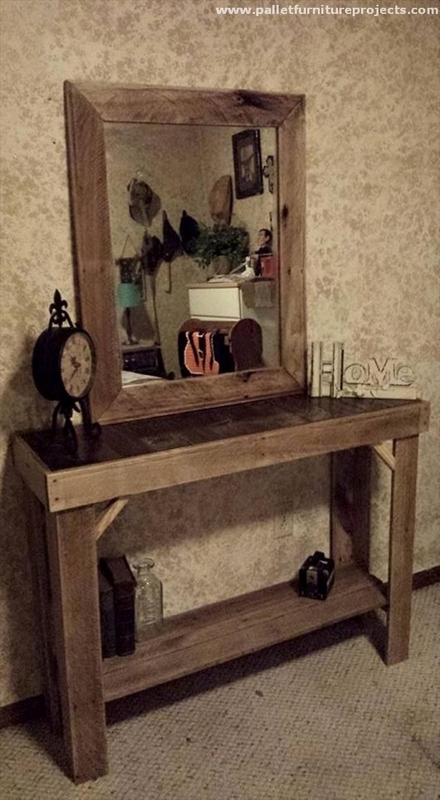 Allow us to start with this simple and decent vanity mirror. This is recycled in such a generalized shape that this can be used in several purposes. But just to create a distinction, we recycled a sleek front mirror especially for the ladies so that they can look into the mirror to decide what else they have got to do to look even prettier. 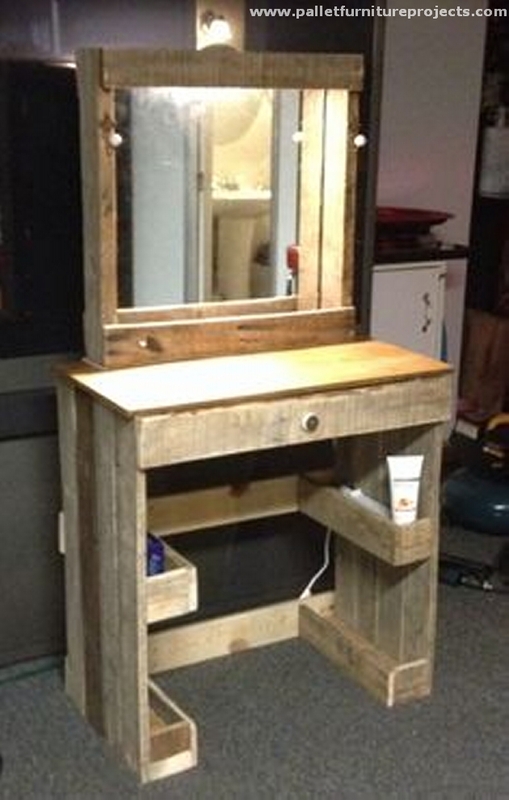 This is a tall and rustic shipping pallet recycled vanity mirror. We have also used the metallic shuttering in the foundation of the mirror space. 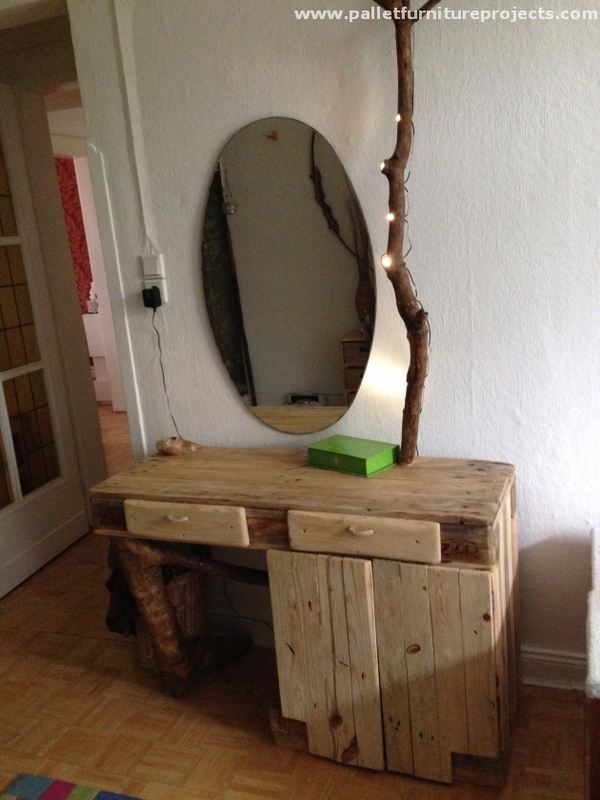 And we hanged a separate mirror on the vanity cabinet, we have equipped it with a lot of drawers. 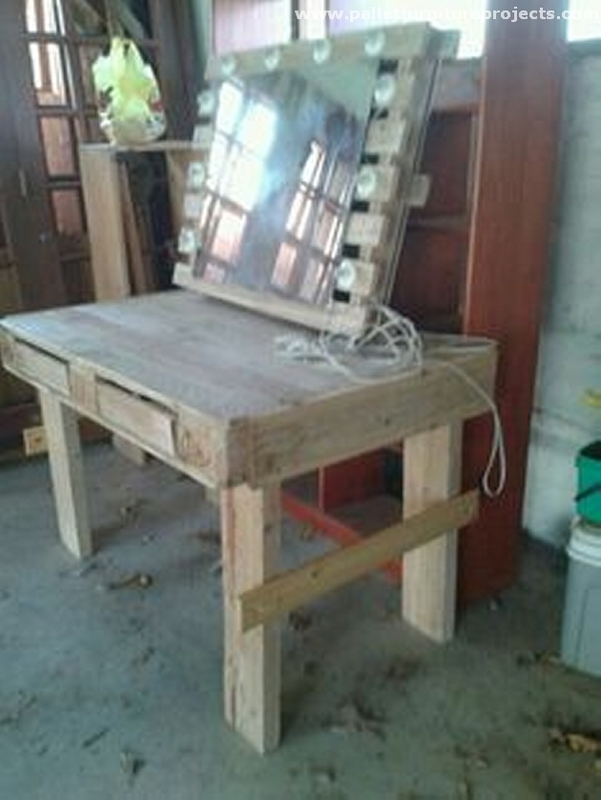 Now this is something inspired from the market base vanity cabinets or dressing tables. 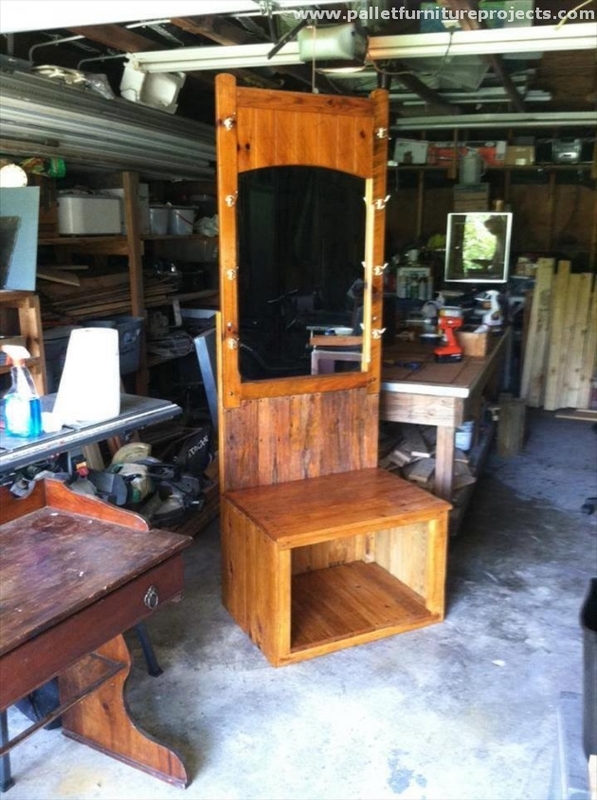 This is grand in size, the mirror is also extra large to reflect the whole body while standing straight. We fixed some hooks on the sides of the mirror. 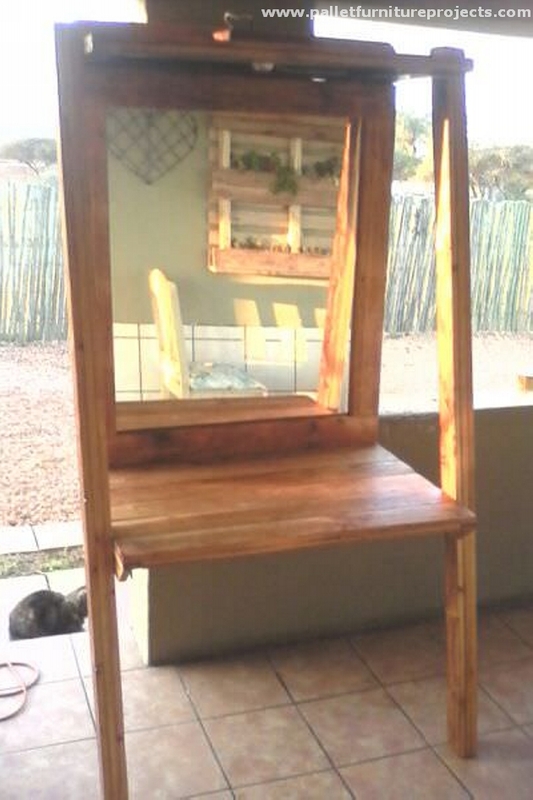 I know this sort of pallet wood creations can not easily be digested by the regular users. These are meant to be designed especially for the ones with great artistic taste. 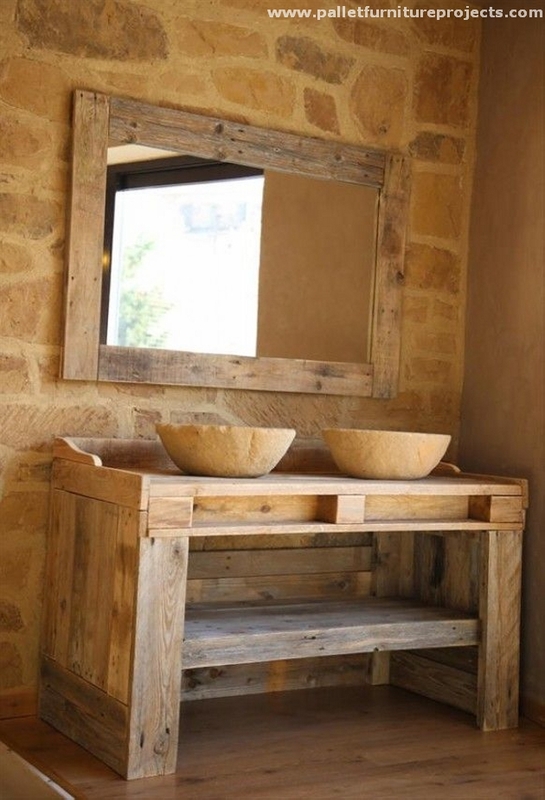 Otherwise the broken pallet planks, dark drawer knobs, and a separate mirror wouldn’t make an impact on the regular users. What about this one? 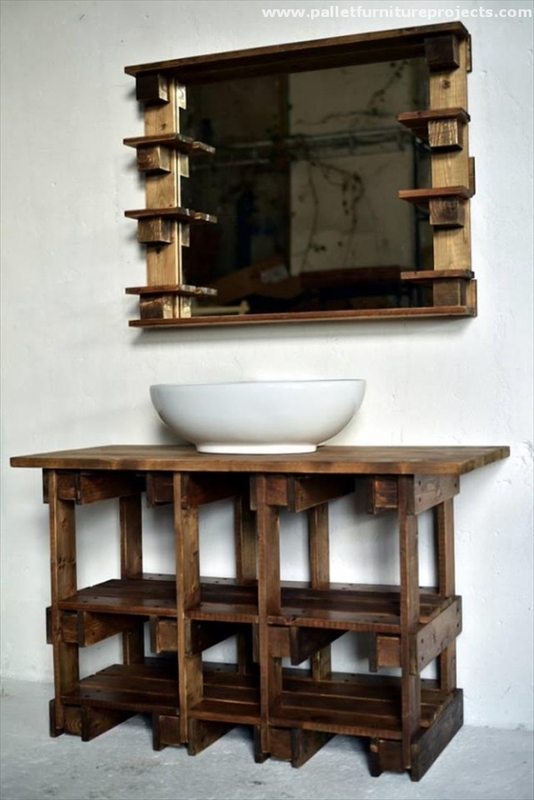 I think this is again made by some cunning pallet wood crafter who wasn’t left with enough supplies of shipping pallets. 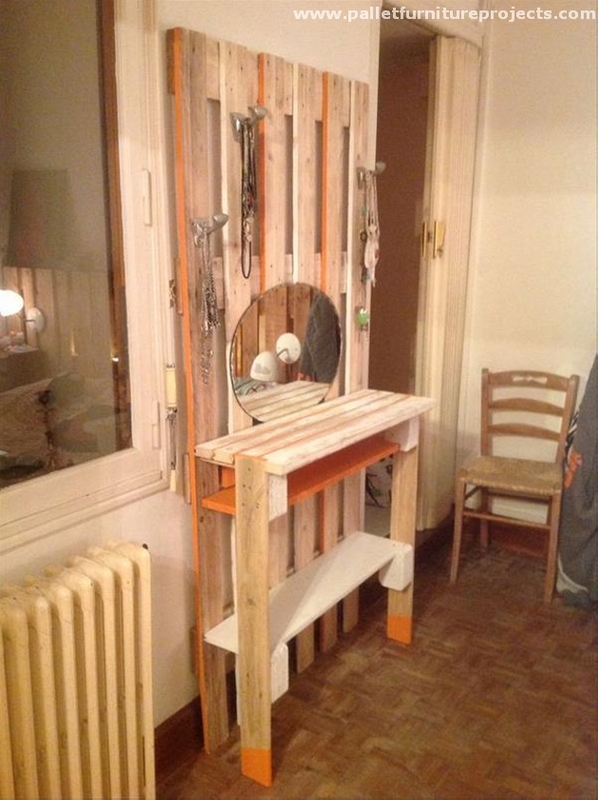 So with the least available resources, he ended up making something sleek and stylish like this one. Wow, I never knew this vanity thing is ever going to get this much crazy. 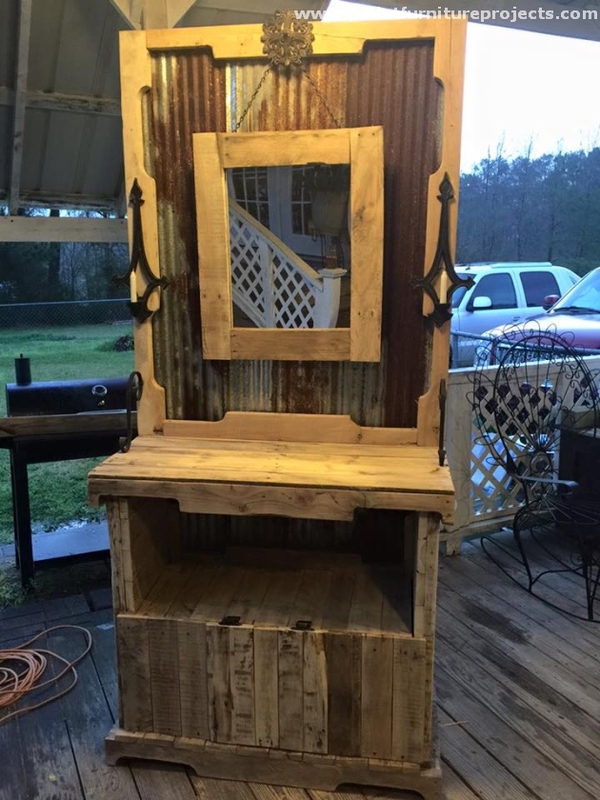 I mean this specific project seems like this is recycled with the scrap simply. 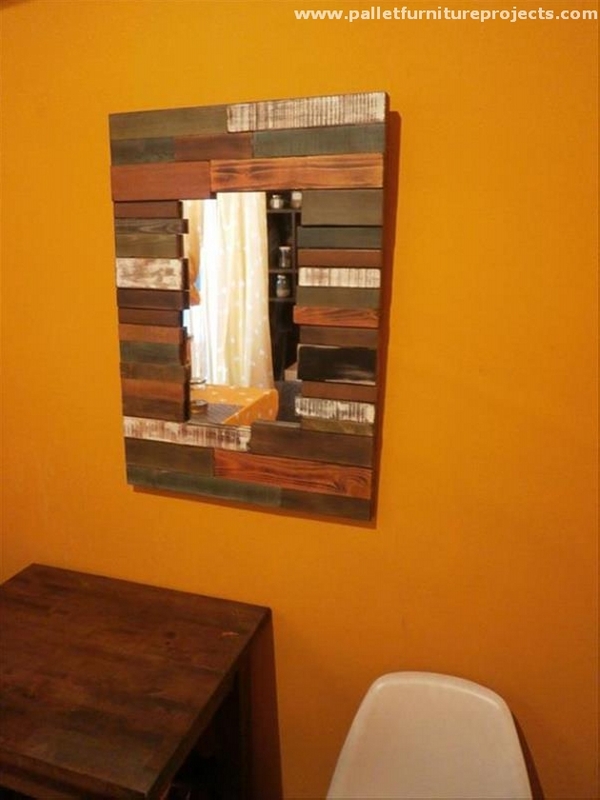 Some debarked wooden pieces along with a piece of driftwood and ofcourse some shipping pallets are combined together to make them look like a vanity mirror closet. The shape of this one reminds me the video games that we used to play outside. 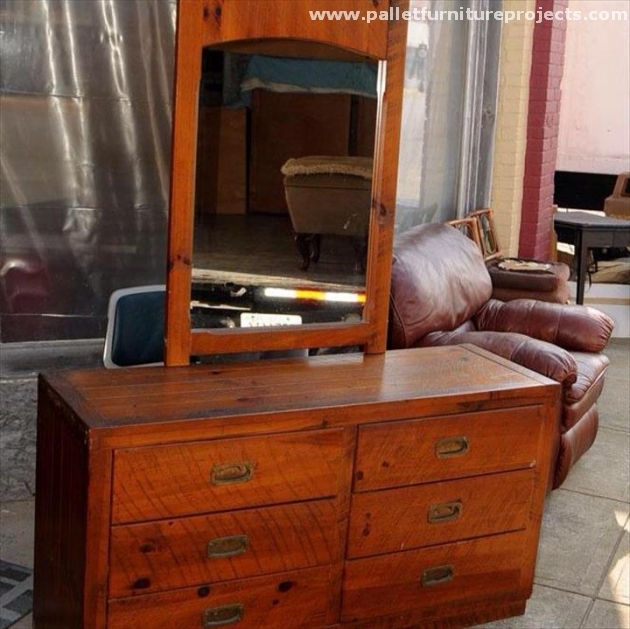 A grand curved front mirror along with extended frontal portions, we didn’t make much drawers but we kept it quite open with some open storage spaces. 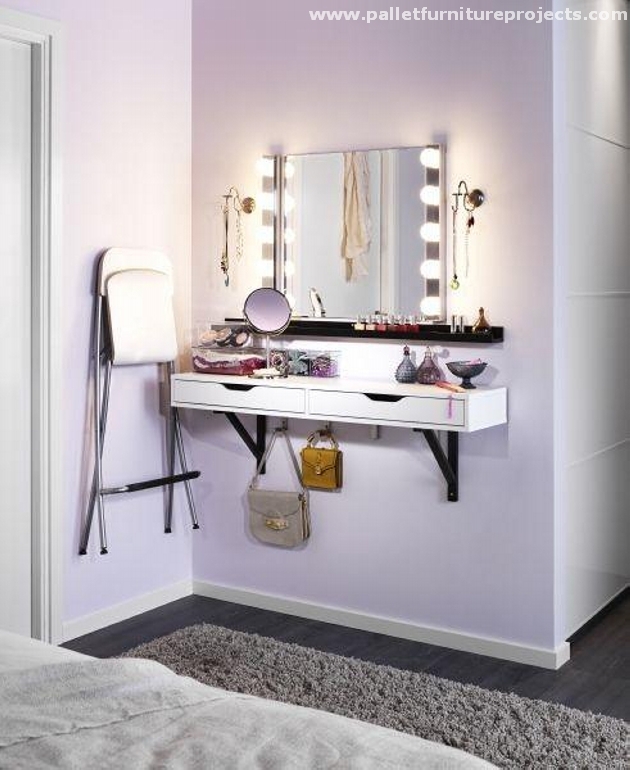 This would be something different from the conventional vanity mirror ideas that we usually see around. While the last one is simply love. I am literally running short of the words to explain how beautifully this is recycled. 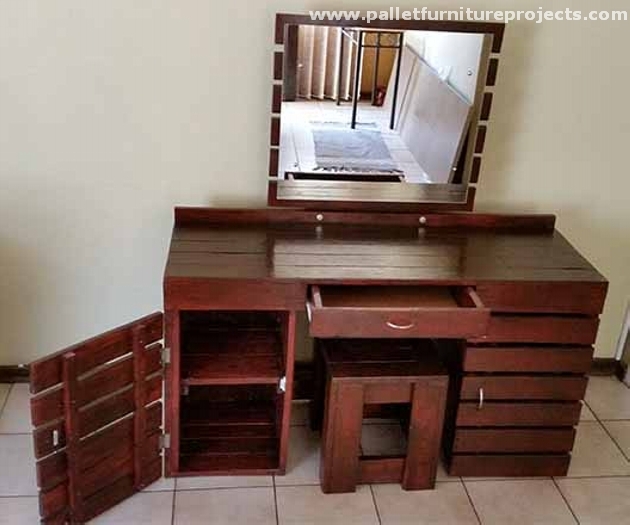 A wooden cabinet with multiple portions is kept on the ground while a matching wooden mirror is installed along the wall separately.